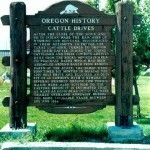 Subject: The old Oregon Cattle Trail along which up to 100,000 head of cattle were driven to eastern buyers. After the close of the Sioux and Paiute Indian Wars the ranchers of Wyoming and Montana discouraged in their attempts to fatten the Texas Longhorn, turned to Oregon for their cattle. During the spring cattlemen and their cowboys arrived daily from the Rocky Mountain Area to purchase herds which had been assembled around Baker from remote parts of the state. 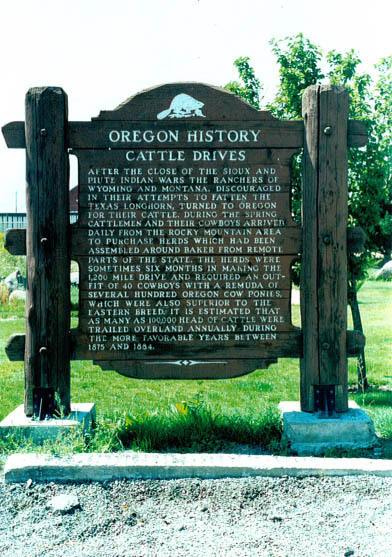 The herds were sometimes six months in making the 1,200 mile drive and required an outfit of 40 cowboys with a remuda of several hundred Oregon cow ponies, which were also superior to the Eastern breed. It is estimated that as many as 100,000 head of cattle were trailed overland annually during the more favorable years between 1875 and 1884.